The other night, as I was laying on my floor paging through cookbooks like usual, I came across an interesting recipe that really struck my fancy. It was for “Bohemian Wedding Cake” and the cookbook was My Nepenthe: Bohemian Tales of Food, Family and Big Sur. Doesn’t just the name alone intrigue you? Am I the only one who lays awake at night thinking about interesting new cakes? 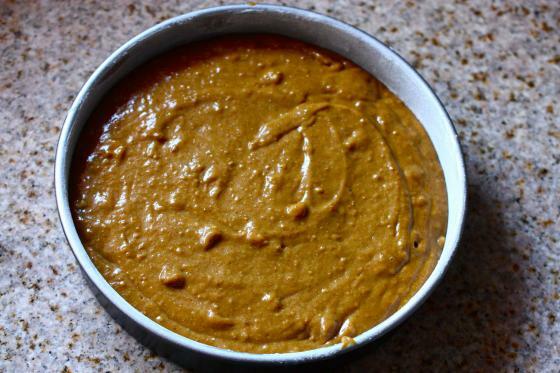 This is essentially a pumpkin spice cake, made with half whole wheat flour, a whole can of pumpkin puree and a healthy dose of walnuts thrown in for good measure. I figured it was perfect for October and it makes a wonderful afternoon snack, served with a tall glass of cold apple cider. The recipe in the cookbook calls for cream cheese frosting, but I was out of cream cheese so I used The Pioneer Woman’s “best frosting ever” recipe and it was glorious. Simply glorious. I’d like to dedicate this one to all you pumpkin lovers out there….this ones for you! Gosh, I just love everything about this cake. Everything. 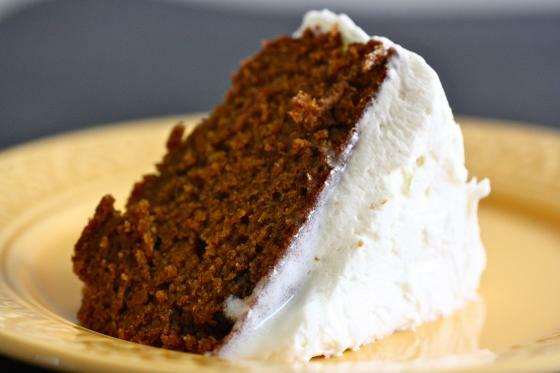 I love the way it’s like a pumpkin version of a carrot cake, love the way it’s so rustic, dense and hearty, and love the use of the word “Bohemian” in the title…. I just love it. Please make it! No need to dirty your Kitchen Aid for this one—this cake comes together in the same method you would use to bake pumpkin bread and involves only two bowls, a measuring cup, some spoons and a whisk. I think it only took me about ten minutes to throw together…start to finish! And then in a separate bowl, combine the oil, brown sugar, eggs, pumpkin and molasses! Molasses = amazingness. So glad I finally picked up some at the store. Now I can bake gingerbread! 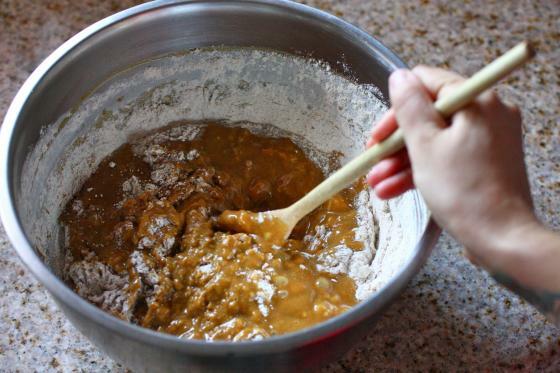 After you combine the wet ingredients, dump the flour mixture back in and give it a good stir. And pour into a buttered and floured nine inch cake pan. I think I’ve said this before, but I really don’t like cooking spray at all. Its made a bunch of my pans pretty gnarly and, personally, if I can’t pronounce any of the ingredients on the back of the Pam can, I don’t want to use it. Plus, everything tastes better with butter. Bake the cake at 350 for about fifty minutes, or until a toothpick stuck in the center comes out clean. Let cool for about ten minutes (resist the urge…I know!) and then run a knife around the sides and invert onto a clean plate. When it’s totally, one hundred and ten percent cool, plop some frosting on that bad boy and get at it. Like I said, I used Pioneer Woman’s frosting (which I highly recommend because that woman knows her frosting! ), but you could really just use anything you want. Brown sugar buttercream would be stellar and so would just a basic cream cheese frosting. Or, if you are more of the minimalist type, just a dusting of powdered sugar would be a divine! And don’t worry about being all perfect with the frosting application, either. This is supposed to be more of a rustic cake anyway. The beauty is in it’s imperfections! Preheat your oven to 350 and butter/flour a nine inch cake pan. Set aside. 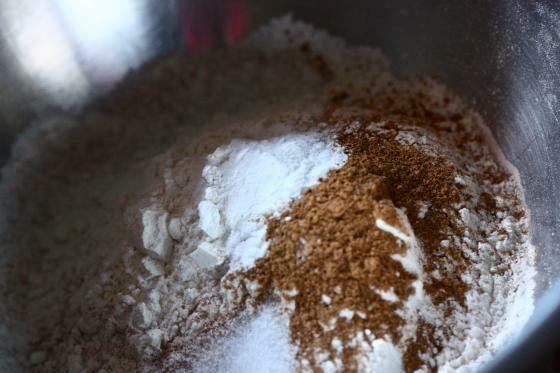 In a bowl, combine the dry ingredients (flours, pumpkin pie spice, salt and baking soda). Mix well. 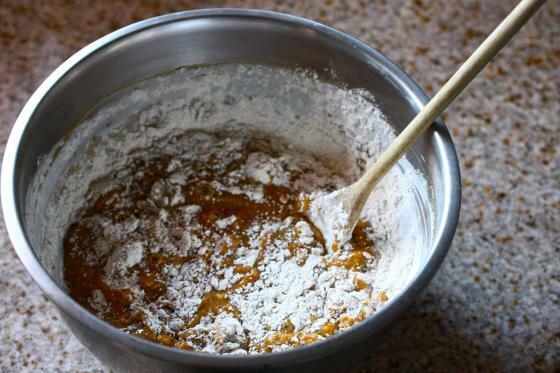 In another bowl, whisk together the canola oil, eggs, pumpkin, molasses, brown sugar and vanilla. Add the dry ingredients and stir to combine. 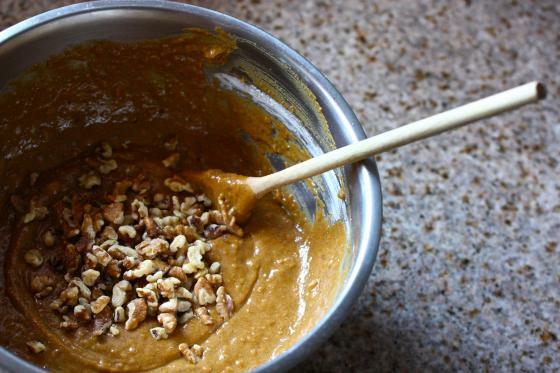 Fold in the walnuts and then pour batter into prepared cake pan. Bake for about fifty minutes, or until the cake starts to pull away from sides of pan. Let cool for ten minutes and then invert on a plate and let cool all the way. Oh – this is my idea of the perfect dessert! Love anything with pumpkin! My gosh this looks SO good Jenna! I love pumpkin spice flavor in the fall.. its perfect for the cooler temps. OH no…I was laying awake last night thinking about pumpkin green monsters and about how to get mascara off my pillow cases. You know, the important things! Hey Jenna, This post reminded me of how much I love cakes but how intimidated I am of frosting — of any kind! The kind I’m most intimidated of is the powder sugar glaze kind that you put on holiday cookies…perhaps that could be a future post, what with the holidays coming and all? Ok, I just wrote a post about being scared of “big cakes” (and wimped out, making carrot cake muffins) but you’ve made this look so easy and accessible that I feel like I can do it! I will do it. And also, yes, the word “bohemian” somehow makes everything about this cake better! I’m sold. I kinda want this for my wedding cake now. Although a wedding probably won’t happen for another 80 years so I better make it myself. this looks so awesome. i am a huge fan of carrot cake and i loveeee pumpkin. Definitely a cake i need to make. I like the raisins though! I am thinking that this cake MUST be made tonight! Like you said, I too love that it is a rustic cake similar to a carrot cake. Sounds yummy! 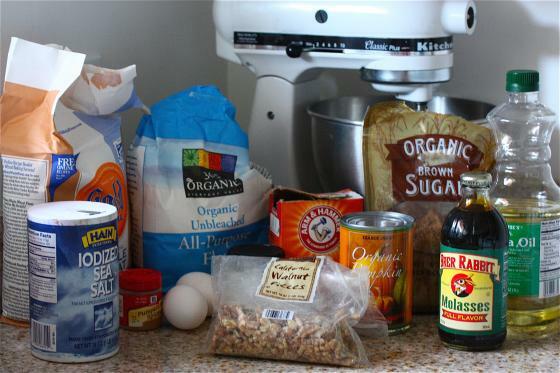 Just out of curiosity….what do you do with all of the stuff that you make/bake all of the time? Your neighbors/friends must love you. 🙂 I pawn mine off on coworkers or I would EAT IT ALL! I honestly think that I gain about 5 pounds every time I look at pictures of all the yummy treats you make. Haha, it’d be so worth it if I can eventually try all of your recipes…It’s currently a goal of mine to make all of them! Yum! Have you tried the harvest cake from the kitchn? It’s a personal favorite of mine and judging from this post I think you would love it! mmm molasses and pumpkin- darn thats a good blast of two flavors! I’m convinced the word “Bohemian” is an ingredient. Like butter and bacon. Makes everything better! My mom used to make Moravian Lovefeast Bread. Moravian! I love it! This would be perfect for Thanksgiving! I think I’ll have to debut it for the family. I’m hosting my first ever Thanksgiving (for family) at my house this year. I’m skerrred. This cake sounds divine. I am so glad that you page through cookbooks too. I do the same every single day. 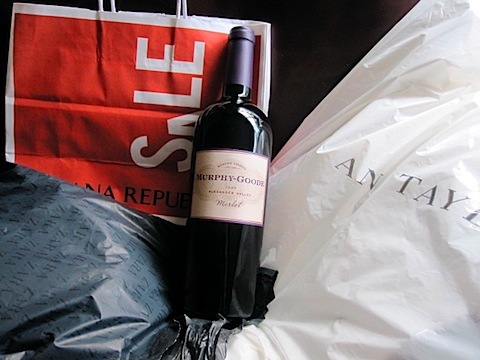 It’s my way to decompress! Of course we’re in love with any and all pumpkin desserts at the moment…and this one is no exception…looks completly delicious…! And with such a catchy name? Love. I WILL be trying my own GF version of this cake. It looks insane. And really, anything with Bohemian in the name deserves to be eaten! Oh my gosh, this sounds incredible! I love pumpkin anything, especially in baked goods. I just want to stick my finger in the frosting. I’m putting this in my pocket for a rainy day. My parents had a spice cake at their wedding, and this could be a great new twist for an Anniversary dessert! oh wow what a stunning cake!!! it looks so moist and full of flavor!! adding this to my ‘to make’ list!! 🙂 thanks! This really sounds pretty delicious. I made pumpkin muffins yesterday and the ingredients don’t differ too much. Oh, and I love the name of course too! Wowww, pumpkin and walnuts? Together in a cake with frosting?? I don’t know if I’d have much left for the cake because the batter sounds like it would taste amazing! (Yes, I’m immature and childish like that!) What a great fall recipe! That cake looks amazing. If I find the time I’m going to turn it into the a bohemian birthday cake this weekend! I love Carrot Cake and thought this was that. But this looks awesome! Never thought of putting pumpkin in a cake. Yes, perfect for an afternoon. 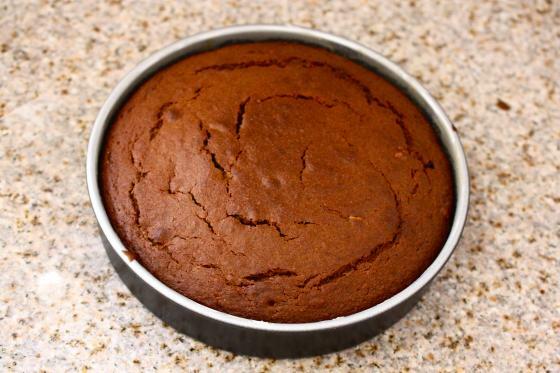 This looks like a nice, simple cake, perfect for fall. The cookbook looks interesting, too. I love Big Sur… Have you made anything else from it? I impulsively bought a can of TJ’s pumpkin last night without any idea what to do with it (like all the other random things I buy there in addition to the usual suspects….). Even though I am a horrible baker, I’m going try this one, thanks! I love pumpkin so this looks absolutely delicious!!! And your calling it the pumpkin version of carrot cake makes me even more intrigued! I decided this will be my birthday cake. Amazing! Ha…I decided the same thing! 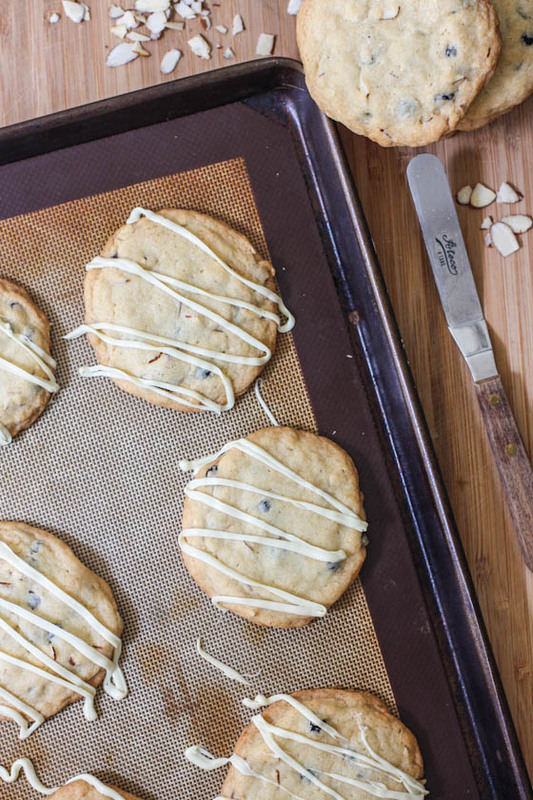 It contains my favorite flavors and looks totally do-able for a novice baker. Yuuuum! I love this easy fall themed recipe. THanks for sharing. 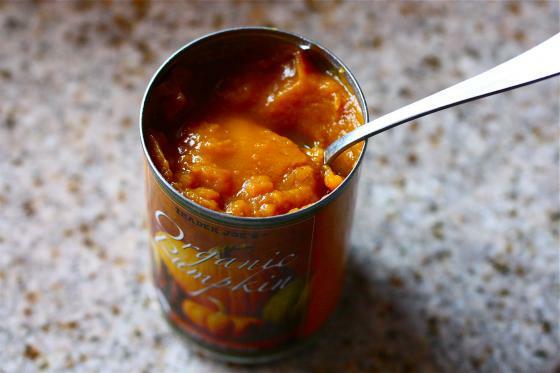 The only thing I’d change is using Libby’s in place of the organic pumpkin – it doesn’t compare! That looks absolutely incredible!! Love molasses – picked up the molasses chew cookies from Trader Joe’s last time I was there…perrrfection. 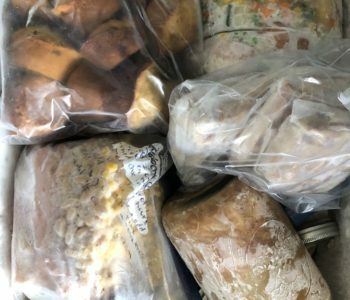 I have to bring treats to bible study tonight – can you FedEx that over to me? Thanks. This sounds delicious and I have all of the ingredients to make it, including some cream cheese frosting in the freezer!! 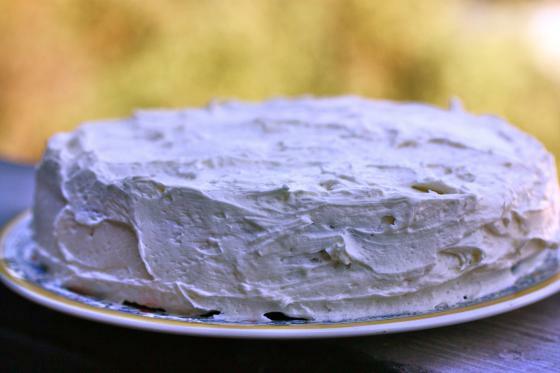 Which I wouldn’t have if I hadn’t learned from your blog that I can freeze frosting – so thank you thank you! yeah….I’ve been making that icing too…..if you have leftovers and keep ’em in the fridge it can spell serious trouble…. I’ve been wanting this cookbook for everrrr and am obsessed with Big Sur and the California coast! (Previous LA resident transplanted back to Canada). You live in a gorgeous part of the world, Jenna… and I am in complete agreement about Bohemian! It conjures up such amazing images of a free spirited love for life! Great post! i thought i was the only one, but yes, i stay awake at night because i have too many baking ideas running through my head! This looks like a glorious treat! I can’t wait to try it, and I promise you, I will! I was in Big Sur over the weekend and now can make something to remind me of it. Please reply ASAP as I am waiting to make this for dinner tonight! Think I might try this for a dinner party this weekend. Question: Do you think a Cinnamon Frosting would be good or overkill on flavor? hmmm no, that might be good! I would overdo it with the cinnamon though…maybe just a light cinnamon buttercream? sounds perfect – I’ll let you know how it goes. i just adore the name of this cake!!!! This looks uh-mazing! I used Pioneer Woman’s best ever icing on my Dexter season premiere cupcakes – white cake, sour cherry jam filling, and this icing. It was to-die-for! I have a cup of pumpkin spice coffee sitting next to me right now and with the smell combined with your recipe and photos I can almost taste that cake! Ahhhhhh, that looks amazing! I dig that it has molasses in it! YUM! This sounds amazing, though I’d go out and buy cream cheese since it’s my favorite frosting. I could eat it plain. With a spoon. Or finger. Your just on a baking mission lately. But they all look so amazing. will you feed me wedding cake? Buttercream anything rocks. As does molasses! Bohemiam wedding. I got married in Vegas on the $199 package special complete with plastic boquet and minister with spiked hair and a tail. Does that count as Bohemian? this was my wedding cake, did not want the traditional one. You’re also supposed to save the small, top layer to be eaten on your first anniversary, we froze it and needless to say there was just a tiny sliver left to be eaten on our first anniversary. 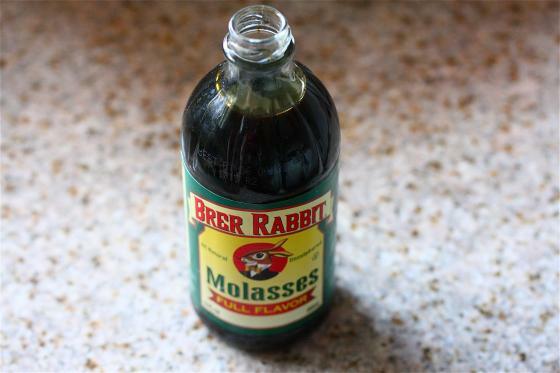 I wondered how legitimate the quality of a jar of molasses labeled Brer Rabbit was when I bought it to make molasses cookies a while ago. I suppose it’s legit now that I see I’m not the only one who bought it! Cafe Nepenthe… one of the best meals of my life, and definitely the best sweet potato fries! I haven’t been—it’s on my bucket list! I agree with you about non-stick sprays (plus I hate the waste). However, a nice alternative is to buy a pump spray bottle from a kitchen store (I guess like a Misto?) which you can then fill with the oil of your choice. I have one that I love and use with olive oil. Of course, there’s nothing wrong with buttering and flouring your dish also! that’s a great idea and something i forgot to mention–thanks, Leah! I’m currently on a pumpkin kick and this looks amazing. Plus I’m a huge fan of carrot cake so I’m convinced this cake can do no wrong. I would be all over this as a wedding cake! I made this last night for a friend’s birthday tonight – so excited to try it! Thanks for the recipe! Beautiful cake! I so want to eat it RIGHT NOW! I love pumpkin, and new types of cake, so this was the perfect post for me! YUM! This cake is so delicious, thanks Jenna! I was looking for a Fall recipe and this came out perfectly, my kitchen is filled with the smell of delicious spices and it is so moist (ew I hate that word, but it did! )… just as I had hoped from your pictures. I used a cream cheese frosting which I thought also complimented it nicely. Will definitely be making this one again! I am going to copy this recipe probably for thanks giving. I was hoping to make this recipe into cupcakes! Does the temperature or time vary if I wanted to do cupcakes instead of a cake? Love your blog by the way! This is the first time I’ve commented but I read your blog everyday for ideas! I’ve been on a total pumpkin-kick lately and this cake looks absolutely amazing! 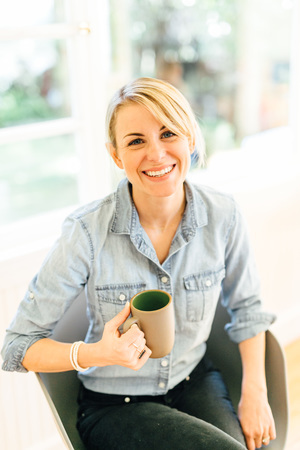 and you’re right, the name of it drew me right in… wedding + cake + Bohemian… in my kitchen??! I can’t wait to make it for Sunday night football! PS: I adore your blog. It’s my “go-to” for recipes, and of course beautiful photos… What kind of camera do you use?? I just made this last night after printing from your blog a couple months ago. Absolutely delicious!!! So moist and great spice. I was out of pumpkin pie spice so just mixed up some cinnamon, nutmeg, cloves, and allspice and it tasted great. Frosted with cream cheese/powdered sugar/lemon juice/vanilla icing – simple and complimented the cake well. This will definitely become one of my “go to” desserts. There’s a 1/05 comment from Joe that points to you + this post.